Take one woefully out of form side, pit it against another with the winning habit and the end result is one only too familiar for Newcastle fans during 2015. 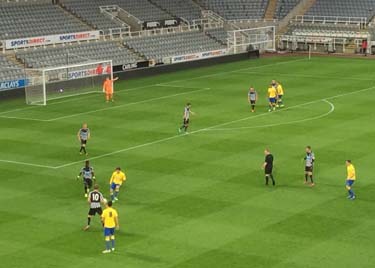 The Rams reserves arrived at St. James' Park in search of their sixth successive league win and boasting a fully functioning defence and attack that had scored 15 goals and conceded just twice during their run of victories. In stark contrast, the Magpies second string have failed to claim maximum points in over four months, lost their scoring touch and never acquired a clean sheet habit. An even first half ended scoreless, but once Alefe Santos shot Derby ahead on 48 minutes and United forward Adam Armstrong saw his shot cleared off the line soon after, the destination of the points was seldom in doubt. Newcastle goalkeeper Paul Woolston defied the Rams almost single-handedly, but he could do nothing to prevent a routine header from Farrend Rawson reaching the back of the Leazes End net in the 72nd minute. Siem De Jong completed an incident-free 45 minutes on his first appearance since surgery on his lung, while his place was taken at half time by our phantom forward Facundo Ferreyra, missing since last November. For the visitors meanwhile, goalkeeper Jonathan Mitchell returned to his former club and helped Derby to maintain their promotion charge with four games left - including another meeting with Newcastle, at Alfreton Town.